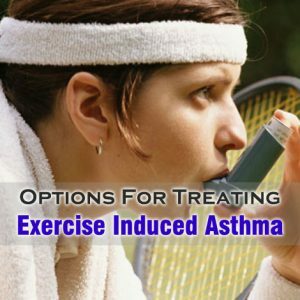 Home > Allergies > What To Do For Treating Exercise Induced Asthma? Exercise induced asthma is experiencing asthma, which is triggered by doing strenuous exercise. Exercising is one of the several factors that can cause breathing problems in an asthmatic patient. Exercise induced asthma occurs due to narrowing of airways in lungs when exercising, and shows symptoms like shortness of breath, wheezing, cough, etc. Actually, exercise is not a cause of asthma, but exercising can trigger asthma. Exercise-induced bronchoconstriction is more preferred word for asthma which is induced by exercising. Treating of exercise induced asthma concentrates on preventing the onset of symptoms. You need to go for usage of medications, and even few lifestyle changes for exercise induced asthma treatment. Medications are generally for treating exercise induced asthma. These medications are to be taken before exercising. Certain time gap is to be maintained between taking medication and exercising. Short-acting inhaled beta2-agonists: These asthma medications are taken before exercising. These medications help preventing symptoms for 2 to 3 hours. Long Term Medications: Taking of long-term pre-exercise medications is also preferred when short-acting inhaled beta2-agonists doesn’t work. Inhaled corticosteroids are the long-term medications that are normally prescribed. These medications are to be taken for 3 to 4 weeks, and they help in preventing inflammation in airway, and also relaxes airway. Go for 15mins of warm-up exercising before starting your strenuous exercises. Make sure to cover your mouth and nose with a mask or scarp when you are exercising in cold weather. And it is even better to exercise indoor. While exercising make sure to breath with your nose because it helps in reaching of warm air to lungs. Try to avoid exercising outdoors when pollen count is high in the air. Avoid doing strenuous exercises when you are having respiratory infections or cold.